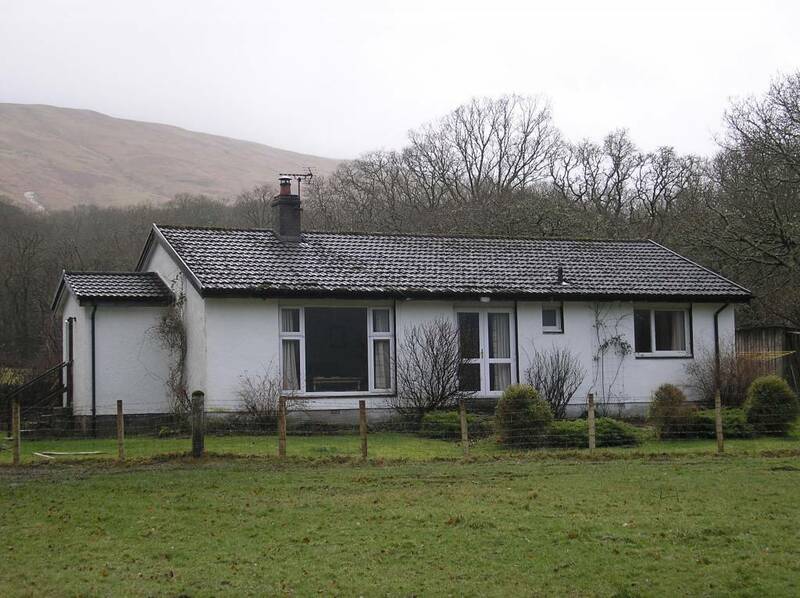 Ardno Bungalow / Cottage | Ardno, Cairndow, Argyll. This is a new house, probably built in the 1970s. It has a low pitch roof of concrete tiles with a sand lime brick base and chimney. The roof has projecting verges and eaves and a large living room window that looks out over the loch. The large living room window and adjacent door is made of double glazed UPVC, otherwise the house retains all the 1970s timber windows. The porch on the gable is also a later addition. The house was constructed as accommodation for a shepherd but now functions as a holiday home. It is expected that the house has 2 bedrooms, kitchen, living room, bathroom etc. (The bothies were rehabilitated in 1974. The first reference to the bothies in separate occupation 1931, but may have come under Ardno estate previously. Architectural details by James Simpson.